The next thing we looked at was the impact of a hacked website on traffic. The chart below shows good news and bad. The good news is that 55% of you said that a hack had no impact on search traffic. The bad news is that 45% saw search traffic impacted by a hack and 9% saw a traffic drop of over 75%. 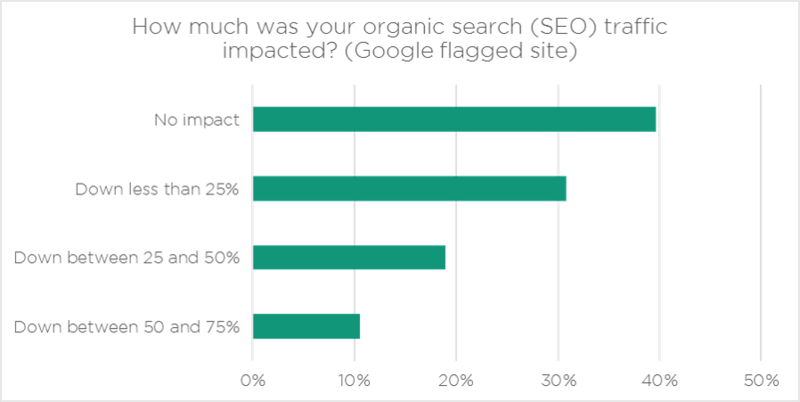 As expected, if your site is hacked and Google notices, you will see a much greater drop in search engine traffic: For people flagged by Google, 77% of them saw a drop in traffic compared to the average of 45%. 14 Comments on "Hacked Sites Suffer Long Term Search Ranking Penalties"
A factor you haven't referred to, that may be a consideration, is that the sites that were hacked may have been seeing "higher than average" traffic prior to the hack, due to numerous distributed brute-force attempts to comprimise the site. Having been hacked and then (presumably) patched/updated the WordPress during the clean-up, those vulnerabilities that were being targetted would have no longer been present, meaning that at least some of the "bad actors" would have turned their attention elsewhere. Solution? - install WordFence and update the core, plugin code and themes as soon as new versions become available ! Thanks for your efforts to make WordPress a safer CMS! Yes and I actually saw a Youtube of someone who was very proud of the growing traffic to her site until she discovered that most visits had to do with spam located on the website. So you always need detailed traffic information to start with. Actually that's how I discovered my site was hacked because from the outside all looked fine. Great article! Having Wordfence installed saved me. I saw an email alert from Wordfence (administrator login) within minutes of being hacked and so was able to react and minimize damage. I do daily backups, so was able to delete the hacked site and restore to a fresh installation of WordPress from the previous day's backup. I've been really enjoying your blog the last few months. So much good information! Thanks for sharing the results of the survey. That number, $2,518, is a rude awakening to a lot of people. I believe the most damming thing is the lost of confidence in WordPress as a viable platform to publish your web page on. Products like Wordfence are so important to the long term value of using Wordpress. I had stopped using wordpress because of the constant attacks and hack attempts and I always hold my breath when new Updates/ Plugin are needed, because more often than not, my pages crash for one reason or another and it take time to find out why. I must admit since turning over all my current sites to Wordfence I have now not experienced further hacked pages and I am more actively involved in daily monitoring of traffic and bulk force attacks. Good Job and thank you for giving me confidence in the future. Long after I fixed my Wordpress site after it was hacked, I noticed that Google was still sending the malware message. So I'm not surprised that this has been an issue for search. I love WordFence and was about to share this post, but I'm seeing a disconnect with the first chart. You lead in by saying "The bad news is that 66% saw search traffic impacted by a hack and 14% saw a traffic drop of over 75%." Yet the chart suggests that 55% saw no impact - wouldn't that leave 45% who did? Further, the bar for down more than 75% in the chart is showing less than 10%, not 14%. Thanks Randy, nice catch. Working to a deadline has that effect - we actually decided to present the numbers differently at the last minute and it tripped us up. Fixed it in the post. A hacked site is such a pain, not knowing who to go to and who is trying to pull a fast one on you. Site lock those guys have crazy prices for stuff wordfence does as a free version. I believe you when you say it could cost between 2-3 thousand dollars. They wanted a few hundred a month and keep that subscription plan while using scare tactics to sign you up. Thanks wordfence. Do you have any numbers on the cost to fix a hacked site excluding the free and lost revenue? What should be pointed up is that if your website was hacked and flagged by Google, just cleaning/restoring the webisite is nof sufficient. After the cleaning is done, you must let Google know that the website is clean. You do so from Google Webmasters console. If you don't do this, Google will continue to presume your website is still hacked.